A Maine Democrat who launched a failed state senatorial run in 2016 joked about the rising suicide rate among white males during a "Values and Vision" community meeting hosted by the Maine Democratic Party, causing others in the room to burst out laughing. Video of onetime candidate Richard Fochtmann joking about suicide was circulated by Maine First Media on Friday, according to the Daily Caller. "A lot of white men were committing suicide, and I almost thought, ‘Yeah, great,'" Fochtmann said while laughing. "Then I thought about it little more and I thought maybe I shouldn't say that out in public." The audience can be heard laughing with the former Senate candidate. Fochtmann spoke with the Daily Caller on Friday, claiming his comment was meant to be humorous. "A joke's a joke, isn't it?" Fochtmann said. "I'm a white male, I'm an old man, and I'm appalled by what's happening to a lot of people my age, and their either lack of morality or whatever it is." "I thought the point of the joke is that it won't be long, and that this won't be a majority white nation, and I think that's a good thing," he continued. The Main Democratic Party gave the following statement regarding the situation, pointing out that someone in the audience called out Fochtmann for making an inappropriate comment. 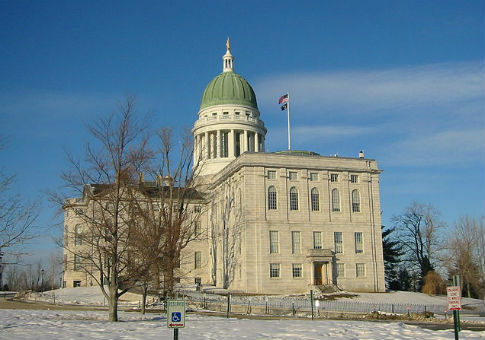 For the past month, the Maine Democratic Party held public forums all over the state of Maine inviting anyone interested to come and share their thoughts on the direction of the state party. Richard Fochtmann spoke as a private citizen at a public forum and unfortunately, he used his 2 minutes at the mic to make his point with an offensive joke. Another attendee promptly stood up and called the comment out as inappropriate. During that same forum Fochtmann stood up and apologized to the group. This video has been selectively edited without the call-out or ensuing apology, and Fochtmann has been mischaracterized as a ‘featured speaker’ or ‘Democratic leader’ in order to fabricate a controversy. In truth, Fochtmann spoke only for himself. Fochtmann unsuccessfully ran for the Maine State Senate in 2016. This entry was posted in Politics and tagged Democratic Party, Maine, Senate. Bookmark the permalink.